CANTAB Connect combines 30 years of leading science with innovative cloud technology, producing the world's most validated cognitive testing software. Improving the chances of success and minimising the risk of failure in neuroscience research, CANTAB Connect technology ensures precise measurement of cognitive function across all cognitive domains. Validated for use online and on tablets, the computerised and automatic test administration removes errors caused by rater variance and allows non-specialist staff to administer tests. Staff workload and the potential for human error affecting study data is further reduced with instant scoring and synchronised data transfers. The cloud-based CANTAB Connect platform enables rapid study setup and close-out, reducing the time to study completion. The software can be deployed quickly to global sites with each site's data streamed back to our central secure data bank ready for evaluation. With parallel modes and automatic stimuli randomisation, participants can be re-tested for longitudinal studies. The tests are language independent making them suitable for cross-cultural studies. CANTAB tests have translational utility meaning that data can be compared directly to preclinical findings. CANTAB tests consistently show high sensitivity to pharmacological and environmental effects in both healthy individuals and patient populations. Automated scoring minimises assessment time, reduces data errors and maximises data accuracy. With intuitive online data vigilance, query management and electronic signature features, CANTAB Connect maintains high data quality standards. With CANTAB Connect at their fingertips, study sponsors can access live data from a range of devices from any connected location. Staff can administer assessments in any location without the need of an internet connection, ensuring maximum productivity. CANTAB Connect uses a highly secure data centre to keep data safe and compliant with HIPAA/GDPR, ISO and GCP standards at all times. All data is transferred using Hypertext Transfer Protocol Secure (HTTPS), the secure computer network communications protocol and encrypted at source to ensure maximum security. With cloud-hosted infrastructure, data can be accessed securely by authorised personnel anywhere at any time. Should there be a fire, flood, theft, technology outage or hardware failure during research, the data is fully retrievable from secure back-ups. 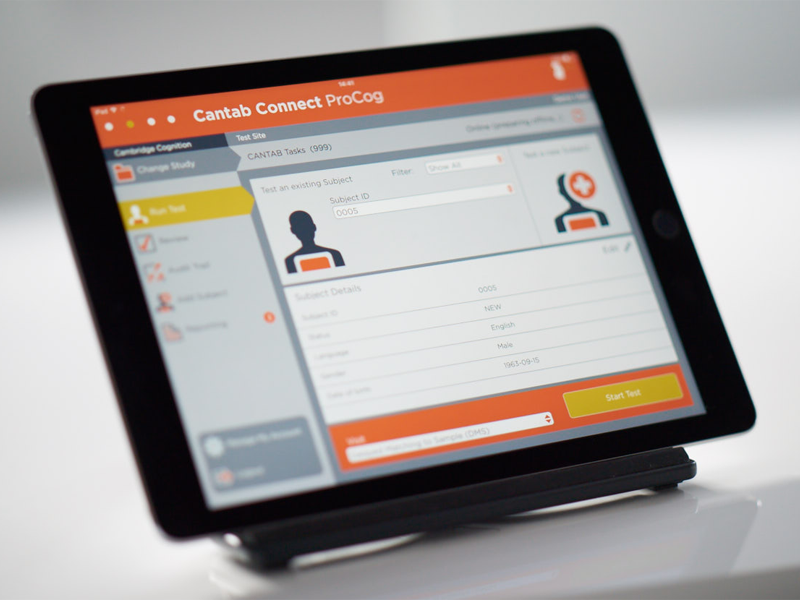 Our customers benefit from access to the CANTAB Connect Forum, an exclusive membership group providing access to training guides, helpful resources and information to support successful study completion, mitigating the need for costly rater training programmes.